Or is it? Over the past three months the Mittelstand’s nonchalance has turned into mild alarm. Seminars and panels for entrepreneurs and managers all over Germany dissect Brexit almost daily. Several federal states, including Hamburg and Lower Saxony, have set up hotlines for entrepreneurs with questions about Brexit. Many Mittelstand companies found excuses not to prepare for Brexit, says Christoph Torwegge of Osborne Clarke, a British law firm in Hamburg with Mittelstand clients. Only two of Mr Torwegge’s 20 clients took Brexit seriously from the start, he says. Now the other 18 are getting nervous. Multinationals such as BMW, which owns the Mini brand and has plants in Britain, can afford a dedicated Brexit team. Smaller companies lack the resources to play around with hypotheticals. As a result, says Mr Persson, most of German business is unprepared, especially if there is a no-deal Brexit. Consider a supplier of Jaguar Land Rover (JLR), a carmaker in Britain. A few weeks ago he rang his lawyer in a panic to ask how he could honour his “delivered duty paid” agreement, which dictates that he assumes all the responsibility, risk and costs of getting his wares to JLR within a day or two, if Britain crashes out of the EU leaving lorries stranded at customs in Calais or Dover. He tried to secure space to stockpile his products in warehouses near JLR plants in the West Midlands, but found they were all choc-a-bloc. The lawyer told him his options would be to renegotiate his contract—or break it. Lucia Puttrich, Europe minister of Hesse, one of Germany’s 16 Länder (states), cites three main Brexit concerns for Mittelstand firms: delays at customs, workers’ mobility and the weakness of the pound, which makes German products less competitive. Less pressing but potentially big problems include different rules on data privacy, tariffs (if Britain leaves the customs union) and export and import licences. Britain is Hesse’s fifth-biggest trading partner. The state exports €4.2bn ($4.7bn) of goods and services a year across the Channel and imports €5bn-worth. At least Frankfurt, Hesse’s biggest city and Germany’s financial centre, stands to benefit from Brexit more than most. Up to 10,000 banking jobs could migrate there from London. There is a silver lining for the Mittelstand, too. In the three years since the Brexit referendum, with its loud anti-immigrant undertones, German firms have found it easier to hire welders and other skilled labourers from central and eastern Europe who began to feel unwelcome in Britain. 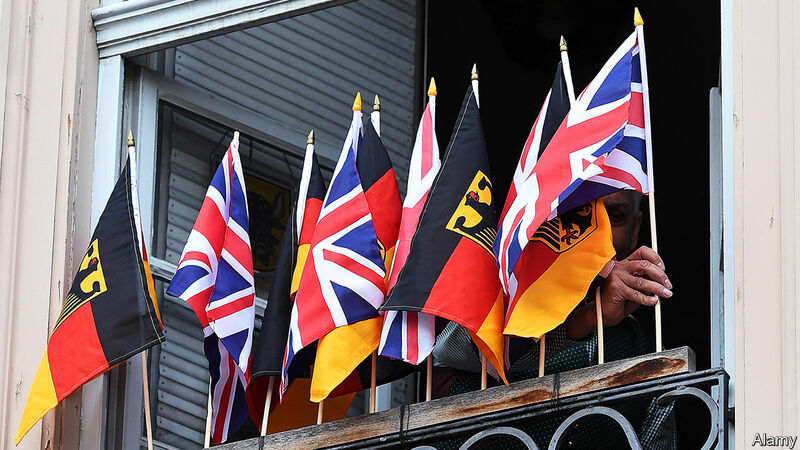 According to a survey in February of 262 big German companies by Deloitte, an accounting firm, many German entrepreneurs hope that Brexit will divert foreign direct investment from Britain to Germany and prompt more startups to pick Berlin over London. Berlin’s Silicon Allee received €2bn in venture-capital funding last year, less than half the sum showered on London’s tech scene. Hans-Peter Raible of Rödl & Partner, a consultancy that works with mid-sized and family-owned German firms, thinks that Mittelständler will ultimately adapt to whatever Brexit brings. BMW scheduled a maintenance shutdown at its operations in Britain after March 29th, the day when Britain was due to leave the EU. Honda and JLR also scheduled down time in their factories. When it became clear that Britain would not leave by that date, these costly breaks were too late to postpone. Mr Raible advises his anxious clients to avoid expensive contingency planning and instead pre-emptively draft new contracts with trading partners and apply for a customs number. Other than that, he counsels, best to wait and see.